October 25,2009 has been a very good day. It started with a wonderful sermon by Christy Snow called "Mastery" but was really about being who we really are--our authentic selves. I needed to hear that. I sometimes play to an audience just wanting people to like me. I guess we're all a little involved in that. The music at church is always inspiring and, since I am also a musician, I appreciate the effort that goes into creating a beautiful, harmonic sound. After church, we had a surprise lunch of my favorite food, chili and cornbread with delicious desserts. Loving the desserts, too. 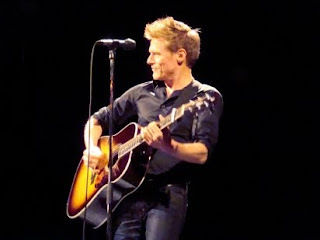 So, filled up with some good spirit, my sister and I went to see Bryan Adams who is doing an acoustic concert. It was just Bryan with his guitar and Gary on piano--no band or loud electronics. I never realized how much his lyrics meant until I heard them sung without the big band behind him. He was funny and kind, explaining how he came upon certain songs and he managed to good-naturedly put up with some members of the audience who were listening to the football game with the Panthers (who apparently lost.) He encouraged the audience to sing along with him and we did--most enthusiastically. I like the McGlohon Theater because of it's beautiful stained glass windows with back lights and charming ambiance but it's also an intimate place. The audience and the performer get to have closeness even if you're in the last row at the back. For those of you who don't know the place, it used to be a church in downtown Charlotte many years ago and was converted into a theater for the performing arts. My day was not marred by a single negative energy or event. The worst thing that happened was that my sister and I didn't get to stay to eat the food we ordered--but they gave us our coffee for free because the service was slow and I felt that that made up for it. Tomorrow may be crap. The sky might fall or a bill come due, but for now, I had a great day and just wanted to share it with you. I have to treasure perfectly good days because they don't happen that often and must be held in graditude. And so it is. 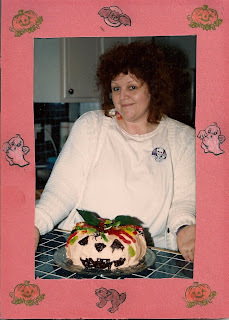 This is a photo of me with my pumpkin cake. I made it for my friend’s Halloween party some years back. Halloween is just around the corner. It’s my favorite holiday because I can become anyone or anything I want from a witch to a walking hamburger. My most inspirational costume was a dead foot on a flip-flop—a sort of after the accident clean up object. I used a green sheet as the foot making sure to create each of the toes and painted the toenails with red fabric paint. The flip-flop was created from a piece of egg crate foam used on mattresses and a large flat piece of cardboard. I was the foot with the flip-flop hung over my back using a strap wedged between my head (the big toe) and the stuffed stand up toes that ran across my shoulder. It was a pain moving around but worth it. My friend, Kathy Groce used to give a Halloween party every year and each year had its own theme. So one year, she decided to make it like a carnival. Each guest played a game to win tickets for the other events. Her brother, Dave, who is a tall, handsome schoolteacher, was a tattoo artist. Okay, actually, the tattoos were the kind you apply water to and they come off on your skin. A couple of showers and they’re gone. My “booth” was the fortune-telling booth. I read palms and gave a little gift of a fortune telling fish to each of my “customers.” I found the little fortune telling fish at a magic store up the street. What I loved most was that some people actually believed I had the ability to tell their future and one person wanted to hire me for another party. Were they just gullible, or was I just that convincing in my roll? Madeline, my 8-year-old niece, is as excited about Halloween as I am and planning her costume as we speak. I think she called it a witch princess outfit. I guess that means it’s Cinderella dressed in black. I’d like to figure out how to make a Pez container costume. How do you get the candy to shoot out of your neck? I hope your Halloween is fun and safe.